Chris graduated from St Bartholomew’s and the Royal London School of Medicine and Dentistry, and also has a degree in Biomedical Science. He was awarded the principals prize in Restorative Dentistry and the Richard Gorham shield by the Wessex branch of the British Dental Association. 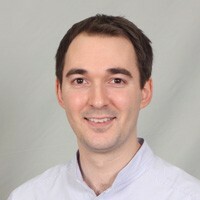 Chris has an interest in periodontics and attends courses regularly in this treatment area. He is a member of the General Dental Council, British Dental Association and British Academy of Cosmetic Dentistry. Chris grew up in Dorset and enjoys living and working in the area. In his spare time he enjoys making the most of the south coast by windsurfing in Poole Harbour, landscape photography and clay pigeon shooting. Mr Trickett carried out my mouth inspection withy the professional expertise I expected. H e also discussed with me my wife's situation and how it might be dealt with, with the same professionalism. Total satisfaction. Very happy with my the treatment i had with Christopher Thickett, all the team were friendly and polite. I am always treated in a very friendly and professional manner. Everything is explained to me in a way I can understand . Appointments are a good experience and everyone has been very helpful to me over many years. Extremely pleased with treatment and experience at the practice. My wife and I have been treated for nine years by a very good practice in Ferndown before we moved to Poole. I am very pleased to find that the same standard is maintained at our new practice. There is an atmosphere of friendly efficiency which, I am sure, engenders confidence in patients. I was very happy with Dr. Thickett's treatment. I have some concern about my wife's ability to negotiate the stairs to the surgery, but we will have to see how it goes. Professional and courteous service as always. Renewed filling with minimum of pain.